Sunset zones: A3; 1-10, 14-17. USDA zones: 3-7. Heat zones: 7-1. Height: 18 inches (45 cm). Width: 7-8 feet (2-2.5 m). Tiny female (1/8 inch long with 2 to 4 scales) and male cones (pale yellow, 1/16 to 1/8 inch long). Gently arching branches packed with branchlets of flat sprays of soft green summer foliage made up of small, scale-like needles that turn bronze-purple in winter. Moist, well-drained, somewhat fertile soil. Are you tired of gardens covered in low growing junipers? I am. Like the popular, hot colors — harvest gold and avocado green — painted everywhere in the 1970s, junipers became the ground cover of choice in the landscape during the same era. 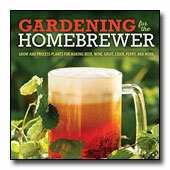 I remember weeding through its prickly needles, or pruning patches of die back. I never became a fan of the low-growing junipers. In the new century, banks of junipers are a worn-out, dated look. 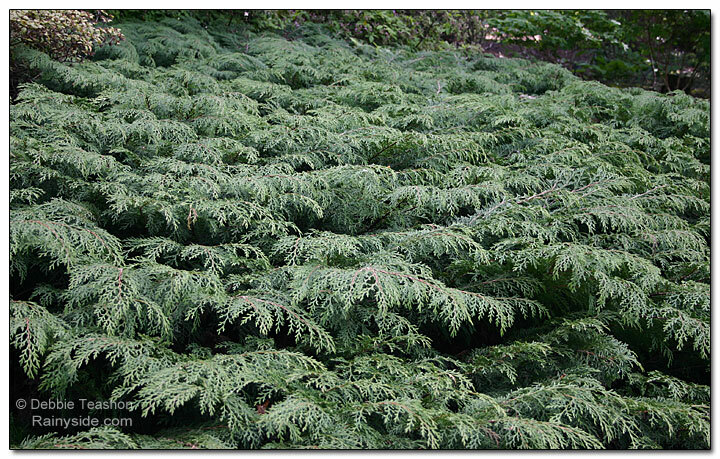 However, prostrate conifers make a great evergreen presence in the garden throughout the year. Even though junipers are related to the Siberian cypress, it is time to rip them out and replace them with a fresh look of the ground hugging Microbiotas. A native to eastern Siberia, it grows in a limited area of a few mountains above the tree line, and bordering forests. Microbiota decussata grows into a handsome ground cover in our cool maritime climate, much to the envy of our heat-loving, southern neighbors. Sprays of handsome branchlets covering the sprawling shrub nod gracefully at their tips. 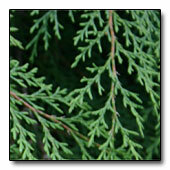 thuja-like, soft green needles appear right at home in our western landscapes. In winter, the needles add further interest by turning bronze-purple for the colder season. As a single species in the genus, Microbiota decussata provides soft, textural effects that pairs well with upright plants. 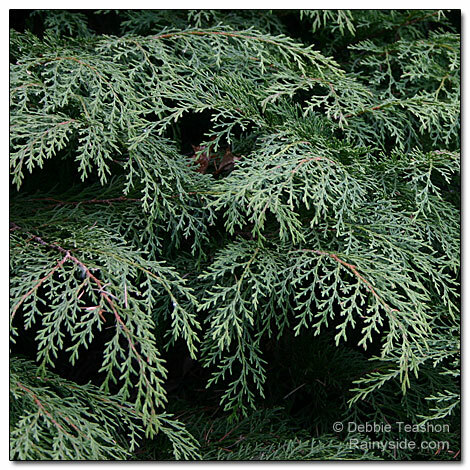 I came across this evergreen growing down a bank at the Rhododendron Species Foundation Garden in Federal Way, Washington and became an instant fan. One of its assets to a garden is it thrives in bright shade. The shrub also grows in full sun, but needs additional irrigation during our annual drought. The downside to Microbiota decussata is it doesn't tolerate dry soil. Photographed at the Rhododendron Species Foundation & Botanical Garden in Federal Way, Washington.